I have been a long standing fan of Camelbak products. I've had one of their hiking backpacks with the internal bladder systems for probably 15 years, in addition to other products. I've found their water systems to hold up well under rigorous use over time. Recently, they sent me one of their BPA-free Camelbak Relay water pitchers to try. First, I found that it is easy to use, and dishwasher safe. 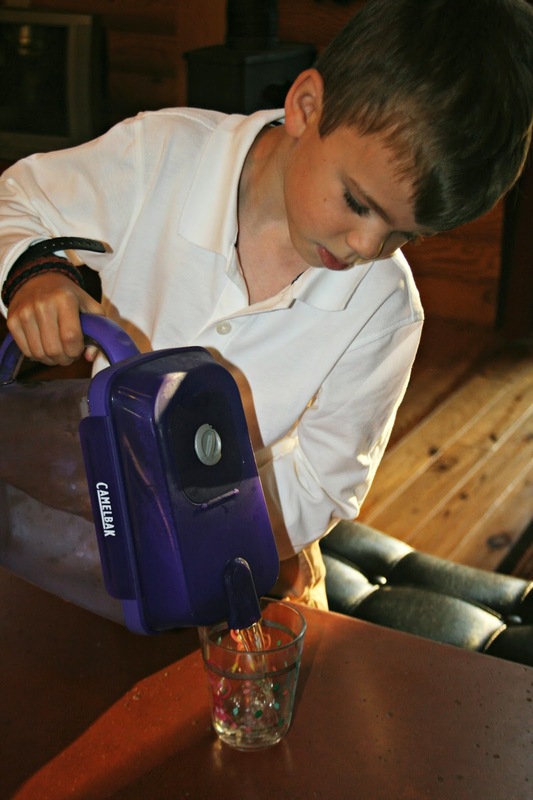 Even Pierce, who is 7, is able to use the pitcher and refill it, as the lid is spill-proof and stays securely in place with side-locking latches. Holding 10 cups of water, it has a slimline shape so it doesn't take up too much space in the fridge. On the top, there is a handy dial system to remind you of when you need to change the filtration system. The filters need to be changed every 4 months - they last twice as long as the leading competitor. Then, just flip the top to refill the pitcher. I cannot stand to drink room temperature water, but I've found if I have cold water in the fridge at all times, I am much more likely to drink it throughout the day. The filter removes 97% of chlorine, taste, and odor. We've been very pleased with Camelbak's Relay Water Pitcher. The water is very refreshing and tastes wonderful. You can find out more about their products by becoming a fan of their Facebook site. Camelbak Relay water pitchers are available at Target, Amazon, and Camelbak.com. Disclaimer: I was sent a Camelbak Relay for review purposes. I was not compensated in any other way for this post. The opinions above are my own. Three lucky winners will receive a Camelbak Relay of their own! To enter, just click on the Rafflecopter giveaway below. Good luck! WE are a Camelbak house too. We finally got the ICE bottles last weekend, and they really do keep the ice longer than the CHILL bottles. Check them out. AS for what I learned about the Relay, I saw the dimensions I needed to see if it would fit in my fridge. "Maybe" if I make room on the bottom shelf. my husband has had camelbacks for years, too. good luck to those who enter! How can a filter last four months without getting bacterial growth in it? I guess thay assume you have a lot of chlorine in the water. We have well water so only a trace of chlorine when we drop it in the well. When we lived in a place with public water, I noticed an orange film in a filter pitcher after about 3 weeks. It was a biofilm, from bacterial growth. Icky. Our water was chlorinated but not heavily because it was mountain water. My girls buy the Camelback water bottles. Entered to win! Thanks for hosting a giveaway! Double Filter Technology that allows you to filter at the speed of your faucet. Made with plant based activated carbon, each Fresh™ Filter lasts twice as long as the leading competitor. Love the colors!!! I'm with you--I like cold water. I buy bottled water because I don't like the taste of tap, but I really need to get one of these and cut down on my use of plastic. I have never heard of this. And I am always trying new water and filters. I even have a water tester!!! It looks really cool, and BPA free! The link you listed didn't work for me but on their site about the pitchers, I learned that it removes "chloramine, chlorine, taste, and odors twice" which is good--our water here is not too tasty. I am going to have to go check this out. I have well water, but would love to filter the water at work! I wonder how it would work with well water. I'm just not a fan of our well water at all. I do love the look and capacity of this product you've shown! I love that the filters last twice as long as other pitchers. I drink lots of water, daily, and having a great pitcher is a must. Thanks for the info on the new pitcher. Glad you like it. I think Camelbak is definitely a good company. I learned that one filter equals 600 plastic bottles. Wow! Love all the camelback products. Would love to win this pitcher. I learned that the Double Filter Technology that allows you to filter at the speed of your faucet which is a huge plus! That's interesting! My Dad used to say, "Always drink bottled water". I have a Camelbak that hold 34 ounces of Propel or Sparkling Ice. I used it for hiking, (until I burned out on hiking)and now use it when I cycle. I agree, a good product. Since 2011, Camelbak has offered a "Got Your Bak" lifetime guarantee on its products. Since 2011 Camelbak has offered a "Got Your Bak" lifetime guarantee on its products. I didn't know Camlebak offers a lifetime warranty. Love there products. The double filter technology allows filtering at the speed of a faucet! No more filling the top and then letting it sit for awhile to drain. AWESOME! I should drink 2.40 liters of water when I hike! My bicycle man has a water bottle and a backpack that he uses all the time. Loves them. I've not heard of the water filter bottle- very cool. 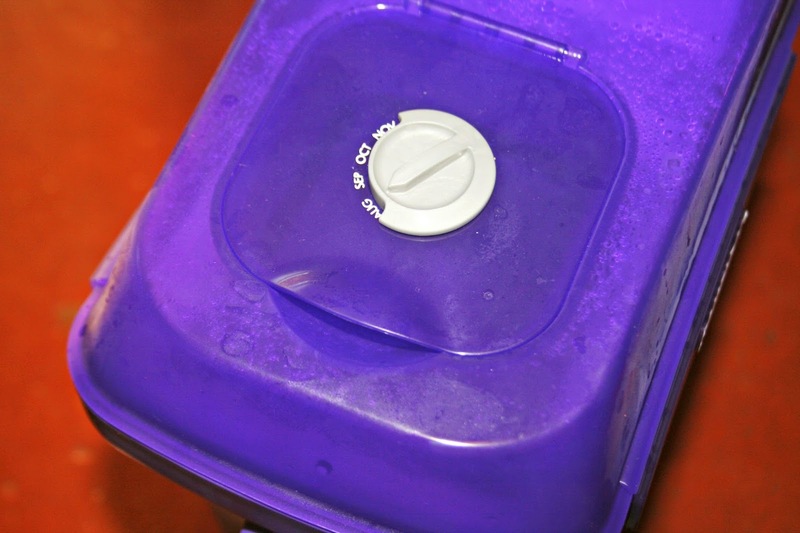 I learned the double-filter design removes chloramine, chlorine, taste, and odors...twice! I learned that this filters the contaminants twice and the filter lasts longer than usual....I like that. I love how Camelbak has a lifetime guarantee on all of their products! Other expensive water bottles and pitchers always seem to break right after the warranty ends! they have a military and tactical section. also, their filtered bottles are "60 seconds to filtered water". this would be great for overseas when our troops are drinking foreign water that may not be completely clean or sterilized. 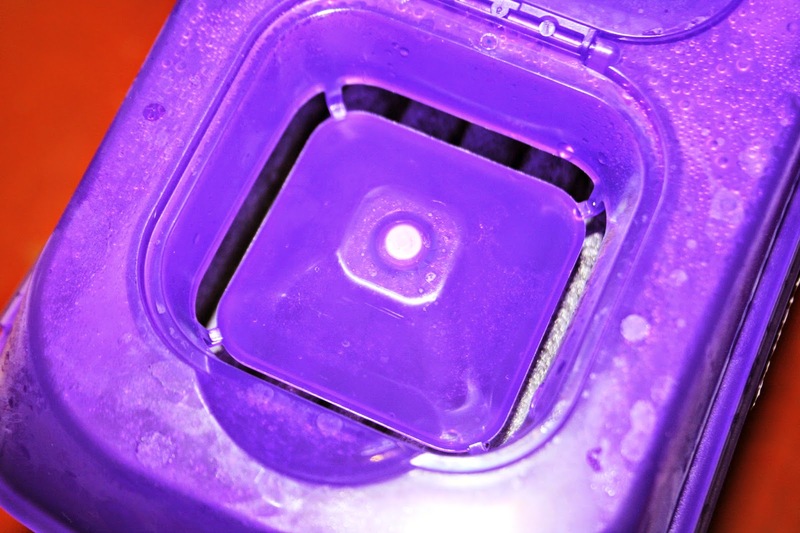 The filter removes 97% of chlorine, taste, and, color. That's great! 600 bottles is the same as one filter!! WOW! That is a lot of plastic! Hope I win!! I did the hydration calculator. By their assessment, I am under hydrated. I like how they show what size bottle will equal the amount of water needed per hour. I learned that it's almost impossible to spill. Handy with kids. I learned The American College of Sports Medicine recommends drinking 14-20 ounces of ﬂuid 2 hours before exercise to make sure you're adequately hydrated. Wow--this is fast! I learned that this filters at the speed of the faucet! I learned that I'm actually drinking enough water (but it would be easier if I had one of these! I've learned that CamelBak company offer the lifetime warranty for their products! Awesome! I learned that the filters can remove odors - as one who is super sensitive to the well water at my husband's family's farm, this would be handy! I learned that they have a Got Your Bak Lifetime Guarantee. I learned that it filters water at the same rate as the water comes out of the faucet. I also learned it has a LIFETIME guarantee! I learned the filters last twice as long as other pitchers & they offer a lifetime guarantee.